The combination of the point and click and puzzle genres is not exactly an original premise. Many of these types of games have popped up in some form or other over the years. However, I cannot think of one that envisages a parallel world of European culture, blended with the surreal, borderline-steampunk themes as richly as the Professor Layton series. Spawning seven games and various spin-offs, renowned puzzle solver Hershel Layton and his sidekick Luke Triton have been posing the puzzles and rattling off the riddles to much acclaim on Nintendo handhelds. It all started in a village, the curious village of St Mystere, so I lower the drawbridge and wander the cobbles to look back at this stylistic puzzle adventure. Introducing the titular Professor and his cohort at the very start, a short film informs you about their search for the golden apple as they drive to the village of St Mystere. 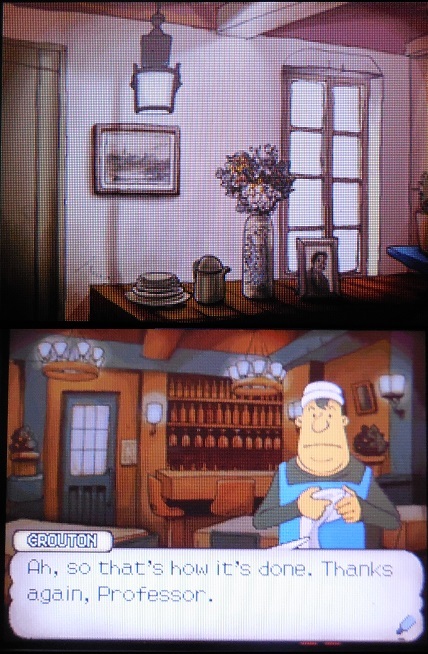 What instantly strikes you about Curious Village during this sequence (and all the Layton games that have followed) is its unique style. Fans of Tin Tin and his cronies will be familiar with the continental cartoon look and colouring, albeit with a slight anime twist here and there. It’s a warm, welcoming design that doesn’t sway you away, even when posed with some very tricky brain teasers indeed. Difficult, frustrating puzzles can dissuade a player, but with the intriguing plot, enjoyable cut-scenes, fine but slightly hammy voice acting and decent range of elements to complete, you find yourself immersed quickly, wanting to solve the next puzzle or uncover the next mystery. It’s a slow start mind, but once you get into the village itself, the puzzles come thick and fast and everything becomes quite addictive. Point and click games by their nature are very linear, so while everything plays out in a strict pre-planned fashion, you do have a degree of freedom at certain junctures. You can wander the village freely if you like, solving puzzles the residents set you or search for hint coins and secret puzzles. Although there are 120 puzzles set within the main adventure, not are all essential to completing the game. Some are vital however to progress or gain access to new areas, particularly the final puzzles as you head towards the game’s conclusion. 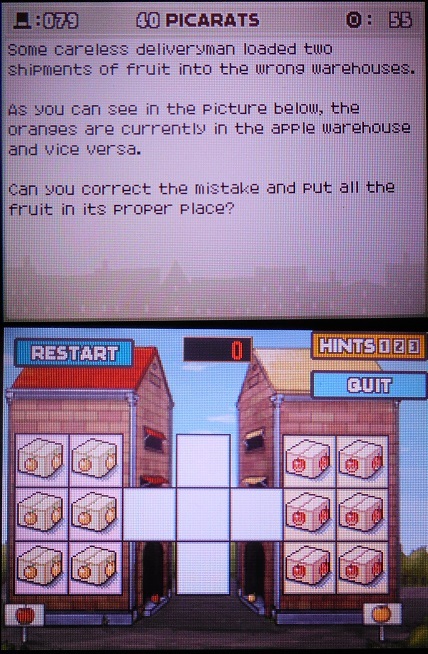 All these puzzles are put across in the same manner, with clear instructions and questions, and all valued by the in-game currency of picarats; the more picarats up for grabs, the harder the puzzle. Encountering puzzles can happen at any stage, and optional tasks can be skipped and stored to be solved later. Said puzzle topics are a mixture of logic, arithmetic, language and problem solving. Some can be a little perplexing and possibly abstract, but all are fair and accurate. After you have completed particular parts of the game, unlockable puzzle sets become accessible, bringing the total number up to 135. In short, plenty to get on with either in a single session or a quick ten-minute play, as every time you reload, you are presented with a very handy recap as to where you were in the story. Aside from the primary element of the puzzles, you have side quests to keep things more interesting. Finding the parts of a robotic dog, the pieces of a painting or organising your rooms at the inn are some examples. These may seem superfluous and maybe tedious, but when completed, they unlock another secret. One thing that’s very important to link all these fundamentals together is the zany and unusual characters within the village. With ungainly looks, eccentric double-talk dialogue and some just plain amusing, the many people you encounter are excellently implemented. Even with some unmemorable and oddball names, the faces become recognisable in an instant. Small snippets of situational humour creep in too, such as the lost explorer or the angry man. This keeps things light-hearted even given some of the darker plot points contained. Presentation is of top quality, like a high-end French animated film, with a catchy, mellow but typical period crime-caper theme and score, altering nicely when the plot thickens, so to speak. Appropriate effects and tidy voice acting is also a mainstay. As already stated, the latter may sound a little hammy, somewhat cheesy at times, but it is in tone with the adventure and despite being a little conceited and the ultimate do-gooder, the Prof is a likable character. Luke can be a tad whiney, a bit state-the-obvious, but he is also likable in a sense, so you can root for your two protagonists without distain. Some plot elements would benefit a little fleshing out, such as the inclusion of Layton’s arch-enemy, who gives no reason or rhyme to his actions and is a rather hollow bad-guy comic character. 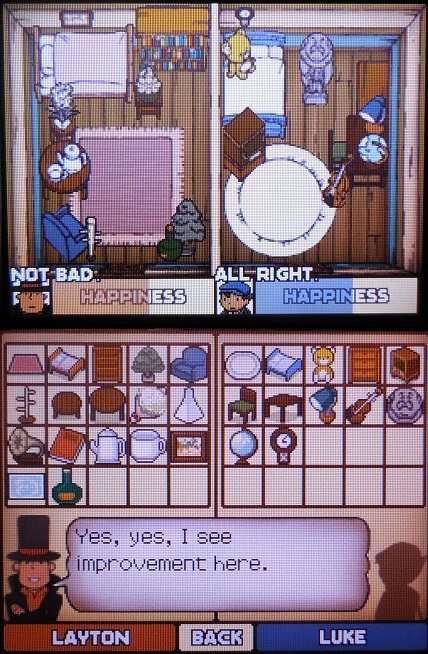 It’s no surprise why the Layton series is such a success, the first game being the foundation to all the others. It’s a game which works perfectly on a handheld, having attributes to fulfil either a single long session or a more casual gaming approach. The puzzles are varied and satisfying, the story is enjoyable and captivating, the animation is pleasant and characterisations are original. The only negative on a gameplay point would be replay-ability: the puzzles are finite after all, so once you have solved them all, there is little reason to return to the game. A single session of 16 hours could result in everything being finished. That said, it’s an acutely presented title with many pleasing and additive qualities, and a fine start for the series. It also caters to many ages given the subject matter. 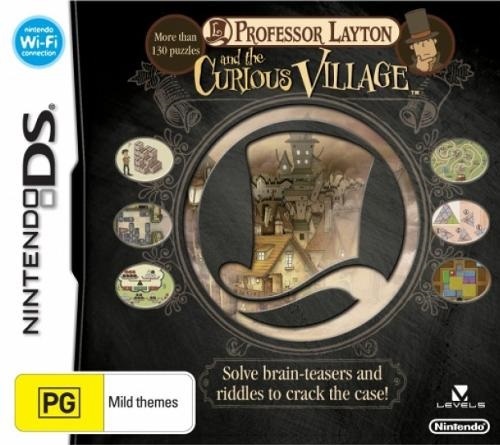 A must-have DS title, so if you haven’t played it yet, join the Professor and explore the curious village.